We traveled out toward Syracuse recently, and I had the opportunity to try out the new Bonefish Grill Restaurant out there. I was asked by my sponsors to try out this new restaurant and compare it with another local seafood restaurant. Bonefish Grill wanted me to “take the challenge”! Well, I’m an adventuresome kind of gal, and I am NUTS about seafood, so I said yes!! Here are my findings. The Bonefish Grill closest to my residence is located in Fayetteville, NY, a pleasant drive for me. We decided to get our dinner before the traffic rush and evening crowd, so we went on a Monday before 5pm. It’s a new restaurant, and the impression is great upon walking in. The atmosphere has a lot of the Floridian style to it (the Bonefish Grill was founded in St. Petersburg, Florida, about nine years ago now). There are palm trees and a lovely cafe outside the restaurant. Inside, it’s “fish” decor, with more palm trees and various fish paintings and images on the walls. There were only a few other guests when we arrived, so I enjoyed getting some extra attention from our server, Erica, who was extremely attentive and offered us some suggestions. Bonefish Grill markets itself as a “polished casual seafood restaurant,” and I think that’s a good description. It’s a place to take business associates here, or to take the family for a special outing, or to come with your friends for a special night out. It’s not a place to order burgers and fries and a Coke. This is seafood dining. When we first walked in, there’s a large open bar to the right, and a larger dining area with tables and some booths to the left. The place reminds me somewhat of a Humphrey Bogart movie, like Casablanca or To Have and Have Not; there are large wooden fans quietly humming over an open dining area; enormous wooden blinds are slightly slanted so that the sun beams through in little yellow slivers; large imitation palm trees in the center of the dining room give off a slightly tropical atmosphere. It’s not a sleepy atmosphere, that’s for sure– reggae-type music belted through the speakers (it was a tad loud for me, but the dining room was nearly empty when we were there), and the bar was somewhat more active with young professionals getting out of work. There’s definitely a lot of atmosphere here: my opinion is that it is best suited to a more party atmosphere, for the younger, professional set. Bonefish Grill is wise to locate the restaurant in Fayetteville, an affluent area of younger people. On to the food: it’s spectacular! My favorite food is seafood, I love it. I thoroughly enjoyed the meal. Seafood, overall, can be rather bland unless you have some good sauces or seasonings– and I think this is where the Bonefish Grill shines. Whoever the chef was who invented the sauce for the Saucy Shrimp– I LOVE YOU. The server Erica said we’d love it, and we did. I liked the Saucy Shrimp appetizer best of all. It’s shrimp sauteed in in a lime-tomato sauce with plenty of garlic, with some Kalamari olives and Feta cheese thrown in. The Feta cheese was the PERFECT compliment to the slightly-sweet sauce. We then tried the entrees. We had a difficult time making our choices: I finally went with the Pecan Parmesan Crusted Rainbow Trout, and my husband chose the Imperial Longfin. Both meals came with our choices of rice pilaf and the vegetable of the day, which was zucchini strips with tomato (which was luscious!). My husband and I tried a taste of each other’s meals. The Longfin was good and lusciously meaty. The fish itself was a tiny bit too bland for my liking especially after having the Saucy Shrimp, because I like spicier foods. My husband loved it all. I adored the Rainbow Trout! The trout was cooked to perfection and there was plenty of it, too. The artichokes on top was a superb touch. I was hoping we might be able to try one of the Bonefish Grill’s desserts, but after our meal, we were literally stuffed to the gills, haha! After the meal, we relaxed and enjoyed some coffee as the dinner time crowd started to roll in. It was then that we decided to waddle to the doors and make our way home. 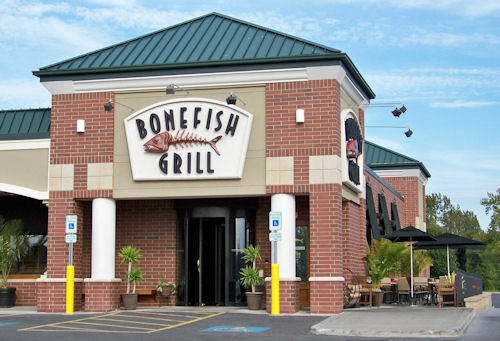 The Bonefish Grill has numerous locations across the United States; most of them are in Florida (no surprise there) but are making appearances in most of the major cities in the nation. You can check the BonefishGrill.com for information on locations, the menus, and see luscious photos of the menu items. 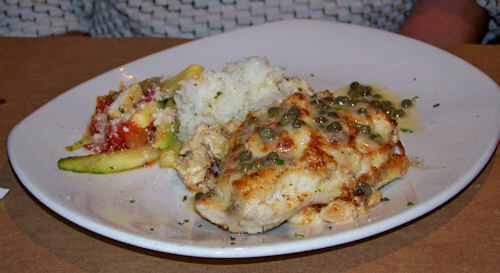 The sauces are the best part of the Bonefish Grill– there are special touches added to the fish dishes (such as pine nuts or wasabi) that really make the meals unique. So on to the comparison with another seafood restaurant: not surprisingly, I chose the local Red Lobster. I like the Red Lobster– I like the very casual atmosphere, the prices, the name-recognition. But like I said, seafood is generally rather bland. You must have some pretty good sauces to make the seafood really delicious. Red Lobster is good, but I don’t like the lemons nor the butter sauce, which is basically what they offer with their seafood. Red Lobster is definitely a great place to take the little kids, because it’s got a more casual environment. The Bonefish Grill is where you want to take your adult friends or your associates, for a very special event or night out. So while I like the Red Lobster for it’s basic everyday appeal, the Bonefish Grill is far superior in menu items and quality of the food. Bonefish Grill is more expensive; Red Lobster slightly less expensive. Bonefish Grill has a “young professionals” party atmosphere to it; Red Lobster is more family-oriented and casual. As I get older, I’m tending to avoid restaurants that have high chairs. No offense to young families, but after 20 years of carrying kids around, I like the adult-only atmosphere. 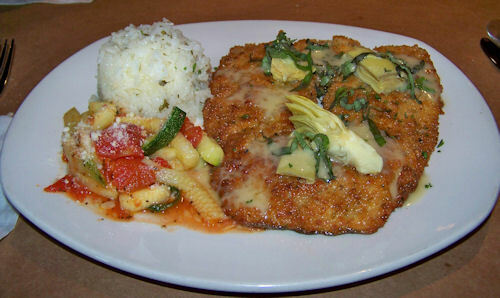 Bonefish Grill has superior food, especially with their sauces; Red Lobster has more menu items, but the food is blander. Bonefish Grill may not be available in your area yet; Red Lobster is everywhere. Bonefish Grill is best suited for a special event; Red Lobster is suited for lunch and casual dinners. Both restaurants have bars. Both restaurants had excellent servers who were attentive and friendly. So would I go to Bonefish Grill again? Yes, I would, especially to try that Saucy Shrimp dish again! I’d like to try some of their oak-burning grilled meals, too– that’s a newer feature that Bonefish Grill is touting. The food is definitely “gourmet” but the restaurant is casual enough so you can relax with friends and not have to worry about sipping your tea with your pinky in the air. Thumbs up for the Bonefish Grill! Remember, I’m a pro-blogger and I am sometimes compensated with stuff or money to review or mention products or services! This was one of them. 😀 You can read more about my blog policy on my Policy page. We love the Bang Bang shrimp at Bonefish Grill. Yumm! We took our son to Bonefish Grill in Indianapolis for his birthday a few years ago. Our daughter just went to a bridal shower there a month or so ago. I think that was near Jacksonville, Fl. When compared to Red Lobster, I would say it is a little more upscale. I wouldn’t feel comfortable wearing jeans there like I would at Red Lobster. Well it definitely looks delicious. I second the rainbow Trout recommendation. I can’t disagree more with these reviews of the Bonefish Grill. I’m sure the diners enjoyed themselves and their tastes were aligned with some of the unhealthy and overcooked items I tried. The calamari was greasy and rubbery a lethal combination. The sauce had been ladled over a mound of rice below the tough overcooked monk fish so as to not only soak it, but rise above it in what seemed to literally be a sweet and sweeter oriental soup. The waitress was rude and the manager did not care at all if our food was poorly prepared or the waitress thought it inappropriate to treat us like human beings. We have had few worse experiences in our combined 111 years of dining and both have cooked nearly every day of our lives. I have a nephew that lives in New York and loves your restaurant, so was wondering if there was a possibility of purchasing gift certificates and having you place in mail from your establishment to be sent to him for his birthday. Please let me know asap.